Love yellow! Such a fun color to play around with. I love that short sleeve equipment shirt and that dress! Super cute. Love the bright inspiration!! I am always loving what you are loving! I've been madly in love with both those shoes for a month now, if only their price dropped by say, $600-700! Great fedora! Love lemon too! 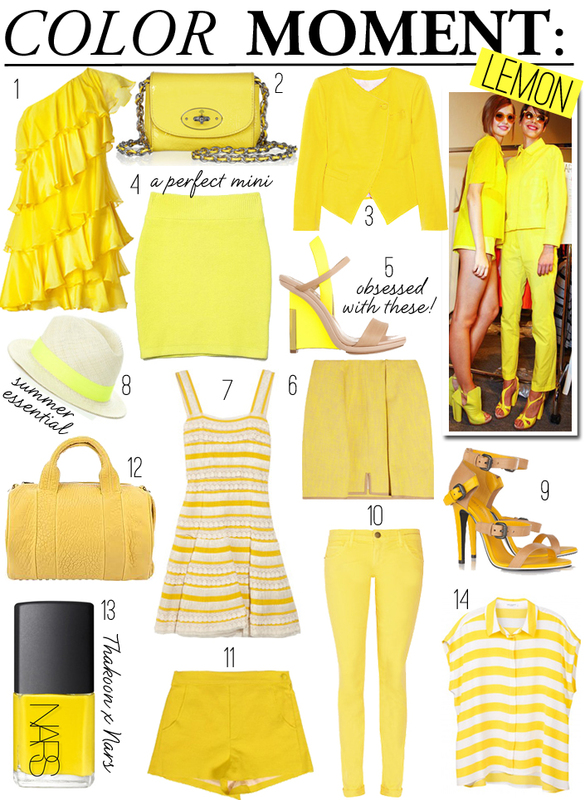 I love a pop of yellow, especially in the summer! I didn't know the rocco bag came in yellow now…cool! Can't help but be happy reading this post – just loving that fedora! I love this post – such a happy shade! This such a great mix of yellow. #5,12,10,14,and 13 are my faves! Yellow makes me smile! Gorgeous picks! Love love yellow. So bright and cheery! So hot for yellow right now! Especially the skinny jeans! In LOVE! I actually have always liked yellow a lot. I have a few things in my wardrobe that are bright yellow and always buy sunflowers when they are in season, its a instant mood lifter.